Just to make things clear I am nothing to do with the supplying company of this kit and there are other kits available from different suppliers, this is solely a review of the kit that I chose to use for my conversion. I have been using my bike to commute the 40+ miles each way to work on a daily basis and being a shift worker I do a lot of my commuting in the dark, mostly on unlit roads. 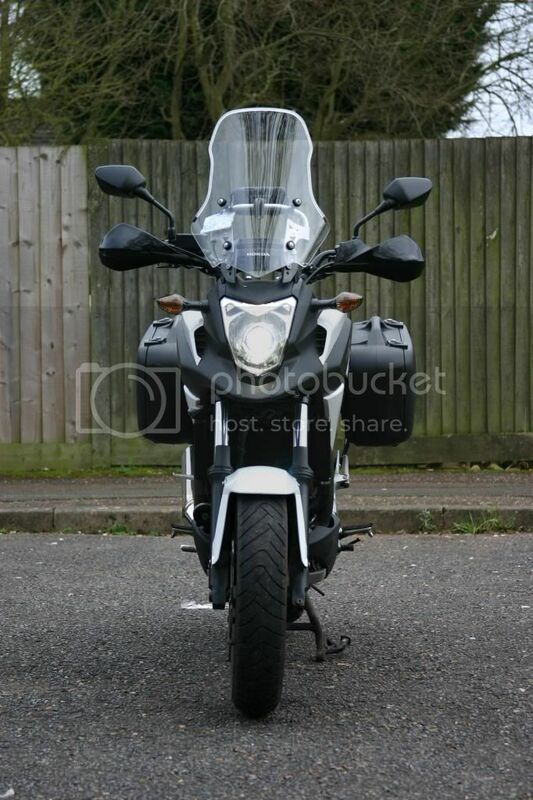 Now I know others on the forum have stated that the headlight on the NC700 is very good in comparison to other bikes, however this is my first bike and my car has HID Xenon headlights and there is a huge difference in the amount of the road that gets good lighting between the two vehicles. I initially upgrade the headlight bulb with a Philips Extreme H4 which was an improvement over the stock bulb but the increased performance was nothing to write home about. I have seen the HID Xenon bulb replacement kits, that don’t uses a projector, and I was not happy to use one of those conversions as they use the original reflector and there is evidence to show that this type of conversion can cause dazzling to other road users. 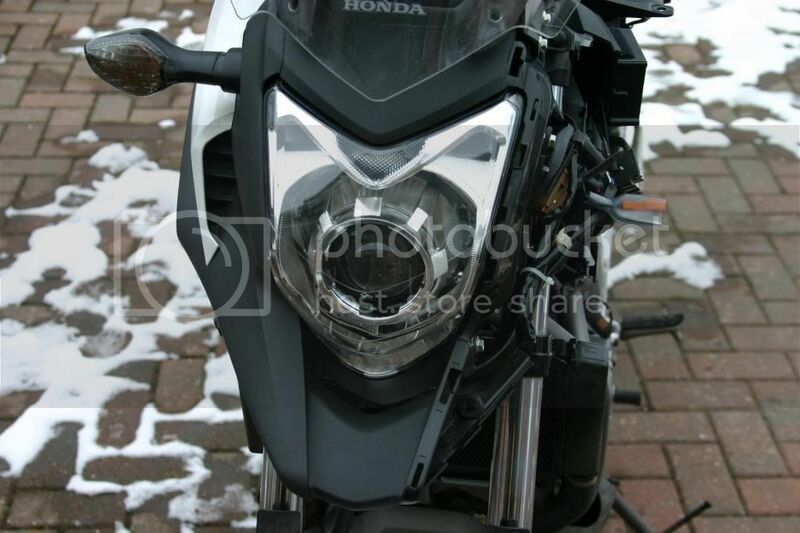 I read with interest the ‘Extreme Farkling – Headlight’ thread on the US version of the NC700 forum, which was started by ‘Beemerphile’, and decided to look into doing the conversion myself. I decided to use a kit that was supplied with a projector and went down a different route, to ‘Beemerphile’ by using a USA sourced motorcycle kit instead of the Chinese kit used in the previous mentioned thread. 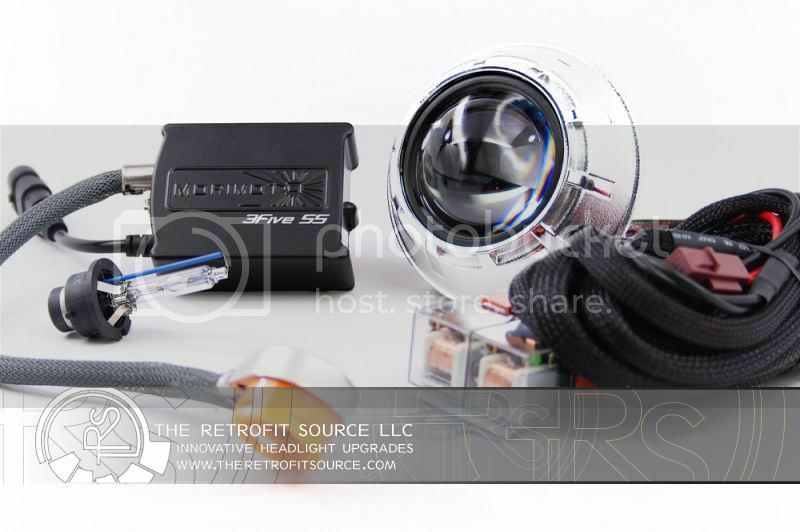 The SPORTBIKE STAGE III KIT, from The Retrofit Source Inc., consists of a Morimoto Mini D2S projector, a Moto 3Five (35w) Long Cord ballast, a projector shroud of your choice (I chose the Gatling Gun version), a D2S Xenon Bulb (you can choose 4300K, 5000K, 6000K or upgrade to a Philips 4300K) and a specifically designed harness for use with a H4 bulb. The projector obviously needed to be ordered for right-hand drive and the Retrofit Source were able to supply this although it’s not an option of their drop down box ordering system, so an email was required. The parts all arrived and I downloaded the installation guides from TRS website, I used the Honda Workshop manual to strip down the bike and remove the headlight from the bike. I removed all of the metalwork and anything else that was removable from the rear of the headlight housing, including the bulb and the cage that secures the bulb, as it was going into the oven. 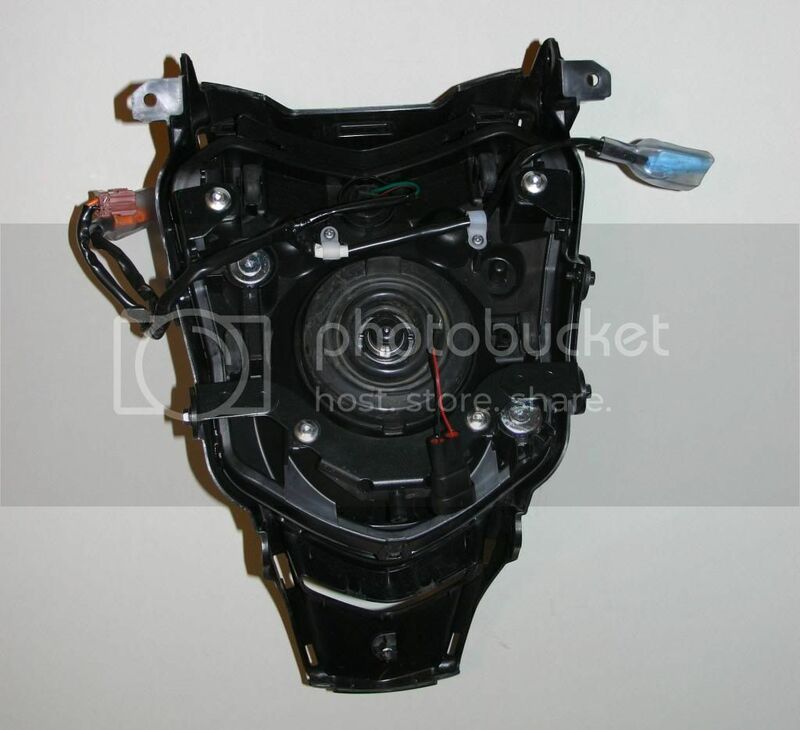 The headlights are sealed with an adhesive to secure the clear lens to the rear part of the housing. 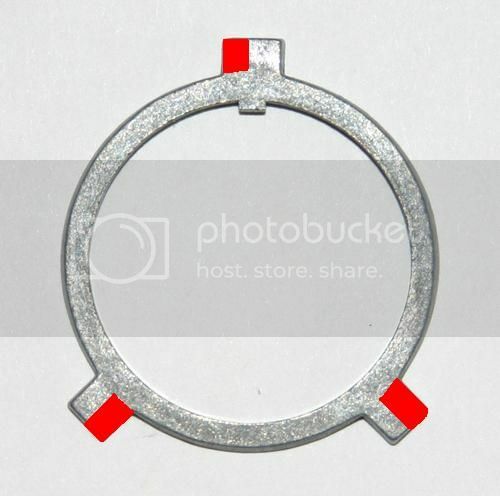 85°C for 12 – 15 minutes is all that is required to turn the adhesive into a thick gooey paste allowing the lens to be pulled apart from the rest of the housing. I wore a pair of gloves from a brand called Mechanix to handle the hot headlight, as they withstand the heat and allow plenty of grip to separate the two halves. Once the parts had cooled down I inserted the projector into the headlight with the supplied gaskets and fed the main beam wires through a slot that was previously where the bulb cage locked into place. Once I was happy that everything was seated in the correct position I tightened the large nut that holds everything in place. I didn’t realise initially was that the H4 bulb in these headlights is slightly rotated which in effect throws the nearside light from the headlight further up to illuminate the nearside more. The two halves of the headlight were then put back together loosely and then put back in the oven, once the adhesive was soft again the headlight halves were squeezed together and all the lock tabs pushed back into place. After cooling I fitted the Xenon bulb and the rubber boot that covers the hole in the back of the headlight, which had to be trimmed to allow the large connector to access to the rear of the bulb and a small hole was also made to allow the Main Beam wires an exit point. The rubber boot on the back of the headlight is the only part that I had to modify making this conversion totally reversible. The connector that is fitted to the power pack was connected to the rear of the bulb and the headlight was then refitted to the bike. The wiring harness supplied is quiet straight forward and the lengths of the wires dictate the positions that the relevant parts can be fitted, fortunately beneath the plastic panels on the bike there is quite a bit of room. The below picture shows the new wiring harness, which is the grey and black shielded cables, together with the red relays and the power pack. I mounted the power pack with industrial strength Velcro as it is in the way of getting to some of the bodywork fixing clips so the Velcro allows it to be moved to get to the clips. The +/- cable that are fixed direct to the battery were quiet long so I shortened them by about 20” each. Everything was connected up and checked before I fitted all of the panels back on the bike. In an ideal word everything would have worked fine however I had a problem, the headlight worked on dipped beam & main beam flash but when I switched to main bead the headlight went out. A few frantic emails to the states later and a new wiring harness was despatched. It turned out that a diode, in the wiring harness, hadn’t been crimped properly allowing it to come loose and therefore not supplying power to the lamp on main beam. This was easily rectified however it did require some of the heat shrink to be removed in order to investigate it. As the harness was not functioning correctly Matt, at TRS, sent a complete new harness. The headlight bulb that I bought with the kit was the 5000K version and it looked quite blue so I decided to fit one of the Philips 85122 4300K bulbs which is a much whiter light, I also upgraded the side light bulb to an OSRAM W5W (501) HALOGEN COOL BLUE INTENSE SIDELIGHT, which is a better colour match to the Xenon headlight. A friend runs a garage business so he offered to set the beam up for me, we had a bit of difficulty with the adjusting screws and nothing appeared to me moving. It transpires that the adjuster screws have a large toothed cog on them into which you insert a screwdriver to adjust the beam. However when you rotate the screwdriver a complete turn the cog only rotates the adjuster ¼ of a turn and the adjusters needed a lot of turning. I took the bike out in the dark after the traffic had died down to see what the improvement was like, there was a huge improvement but there was too much light being kicked up on the nearside which was brightly illuminating road signs and dazzling drivers waiting to pull out of junctions on the nearside. 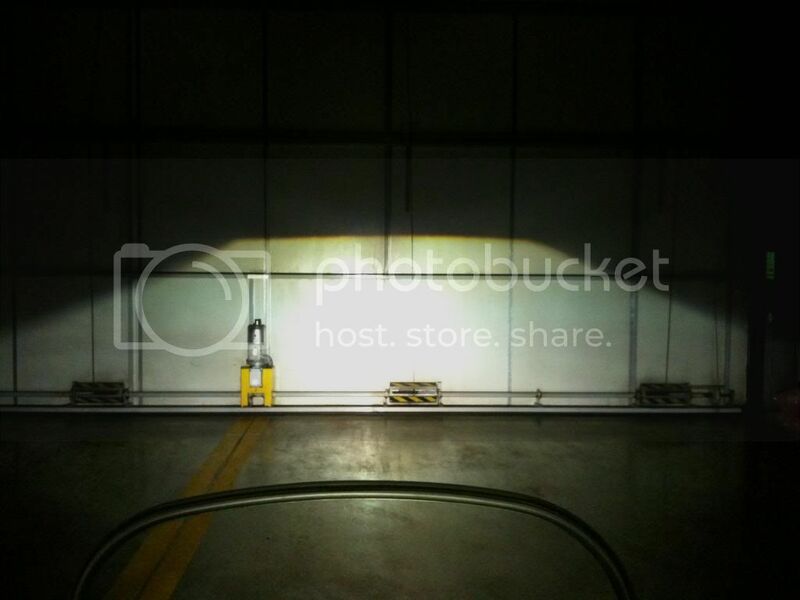 So I did a bit more research and discovered that the H4 bulb in most headlights mounts in a position that is vertical through the axis of the headlight, therefore the bulb in the NC headlight being fitted at a slight rotation from the vertical (about 5° in my estimation) was causing the internals of the projector to be at an angle instead of being parallel to the ground. So the headlight had to come off again for the H4 locking ring to be modified. I used my Dremel to cut away part of each of the three tangs on the fixing plate to allow it to rotate by approximately 5°, this was done by eye with a bit of trial and error. The whole thing was reassembled and back to the garage for the beam to be re-adjusted. 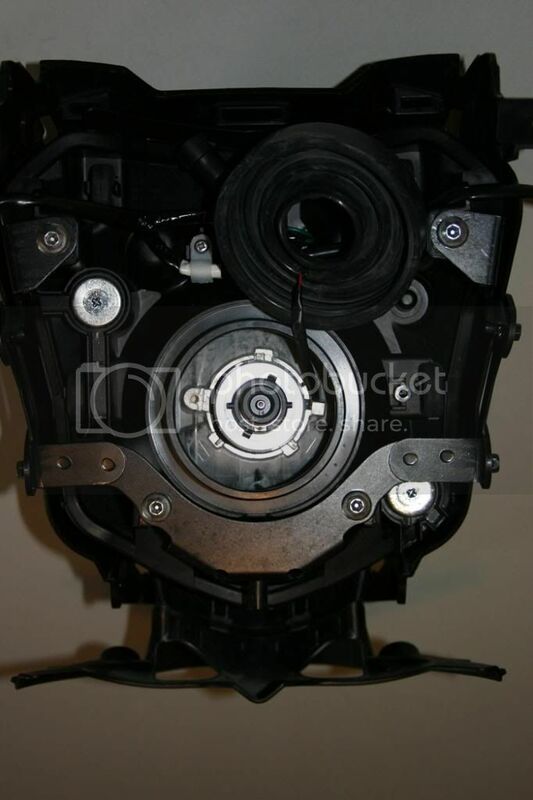 The below pictures show the areas marked in red that I removed from the H$ locating plates in order to rotate the projector to the correct position. And the next picture shows the projector correctly lined up with the bulb inserted. Overall I'm very pleased with the kit and the way it all went together, it would have been better if the diode had been crimped correctly and would have been easier if the bulb hand't been rotated away from the industry standard for the H4 orientation. But of course that all added to the challenge of doing the conversion. The light output is superb and if you do a lot of night riding on unlit roads then I would give this conversion some seriously consideration. The total cost was £125 including shipping to the UK, I did't get charged any import duty or VAT, the only additional expense was the new side light bulb and the Philips 85122 4300K bulb (which I could have bought direct from TRS as an upgrade for an extra $25). I'll try to take some pictures at the weekend showing the new beam pattern, unfortunately I didn't take any pictures of the old beam pattern for comparison. My NC : is gone ..
From what I've seen adding additional lights on the front forks still wouldn't offer the quality of light that the Xenon headlight will offer on both dipped and full beam. If I had added a lightbar and then some additional lights the cost would have been a lot more. The whole job can be done in a day. I've had the headlight out so many times now I have got it down to 30 mins from start to having the headlight detatched. That looks awesome and well worth the effort.. don't think I'd be up to doing it myself though, even with the detailed instructions.. I'd be left holding bits of kit wondering what the hell have I started..!! Very well done Dave, that is very impressive. It is a really well set up kit and all the downloads from the TRS website show where you need to plug things together. 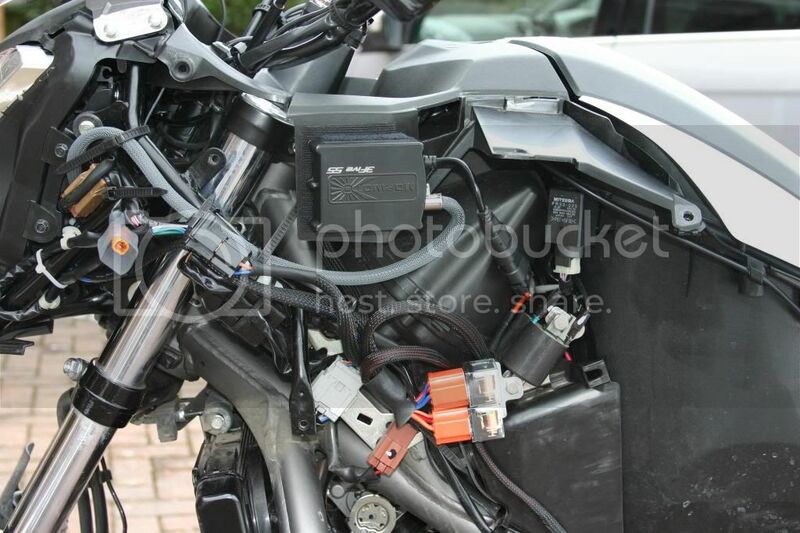 The harness connects to the battery, then the headlight bulb connector fitted to the bike is plugged into the new harness, the power pack is plugged into the harness and the lead from the power pack power the new Xenon bulb, the final connection is from the new harness to the high beam solinoid in the projector. Thanks Paul, the hardest bit was plucking up the courage to put the headlight in the oven!! 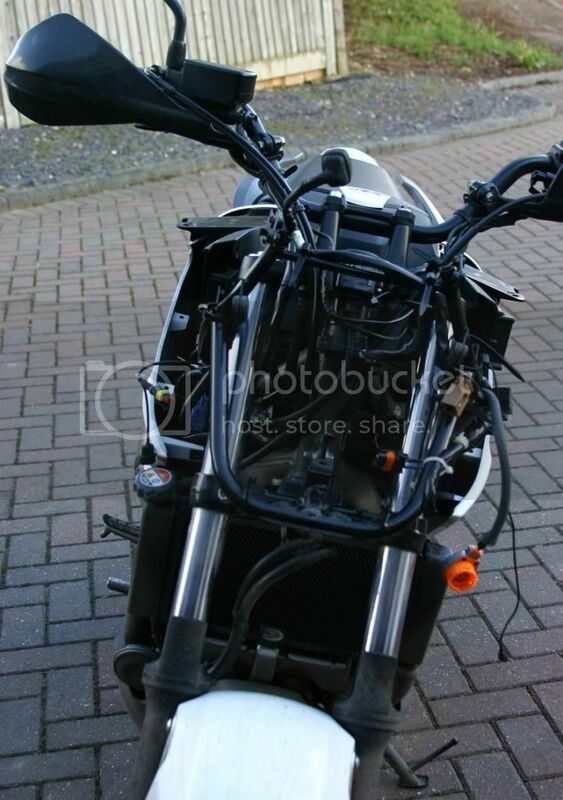 Picture below shows the bike with headlight removed. A great write-up and obviously you must have great satisfaction from the end result. I had to pay customs duty, plus a hefty admin fee for a small bit of kit from the USA, how did you get round the excise duty? I bought it back in November and I can't remember what had been put on the customs form on the parcel. Thanks, it has made a huge difference to night riding. I'll try and take some pictures to show the beam. Nice work Dave.I don't need to ride much at night but really enjoyed reading your report. Well done Dave. It`s always scary taking your bike to bits. Not sure if I could bring myself to put bits in the oven though. 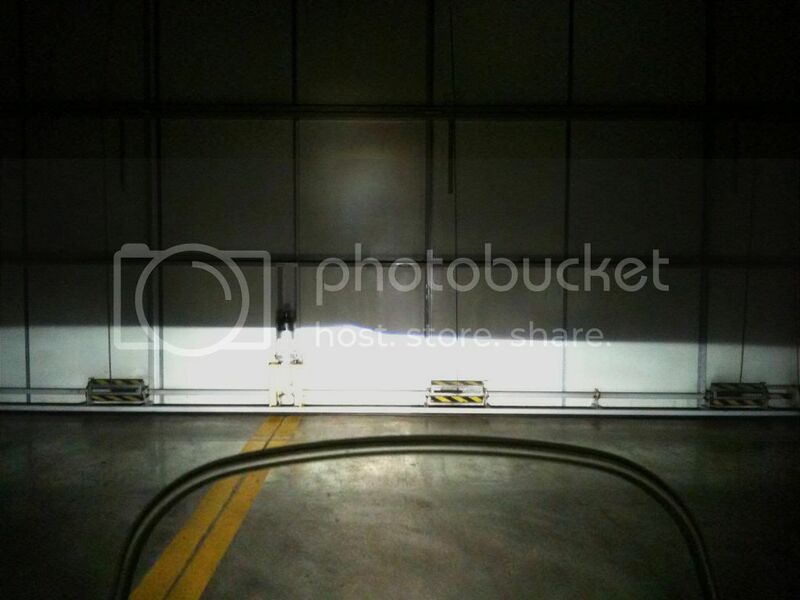 The below picture shows the dipped beam pattern. I'm really pleased with the coverage and the light quality that this conversion puts out. It's a shame that I didn't think to take a picture of the standard headlight beam pattern for comparison. Impressive! You must be chuffed with the end result of all your hard work. Yes, very pleased, just done 40 miles cross country on unlit 'B' Roads and the light is impressive, well worth the effort and expense given the amount of night riding I'm doing. There is certainly no need for any additional lighting with this conversion. The end result looks professional! Not sure I could strip my bike down like that to fit it all in though! I'm have a issue with the Main Beam not cancelling, I'm having to to cycle the switch 4 or 5 times to get the shield to go back to the dipped beam position, which obviously isn't good for oncoming traffic. I've been using the conversion for a few weeks now and probably done about 400 miles of night riding when I use the main beam as often as I can. It seems to be either the shield is catching on something or the solenoid is sticking. I've been in touch with TRS and they are dispatching me a new projector, complete with a new shroud as these have to be glued onto the projectors. I'll keep you posted on the reliability of this kit. I followed the Service Manual for the strip down and TRS have downloadable guides for the projector install. There is quite a lot of room under the plastic panels for additional items to be fitted. Seems like they're very keen to sort you out - really can't fault them with that! Location : Morecambe by the sea. You've done a fantastic job there, definitely a lot more than I would trust myself to do.